The ROEQ L150 is developed to support internal logistics in industry and health care facilities. The basic functionality is to use MiR100™/MiR200™ with the Lifter Top Module to move goods between logistic points. The Lifter Top Module can be customized to support a variety of pallets and fixtures that are already a part of an existing assembly flow. 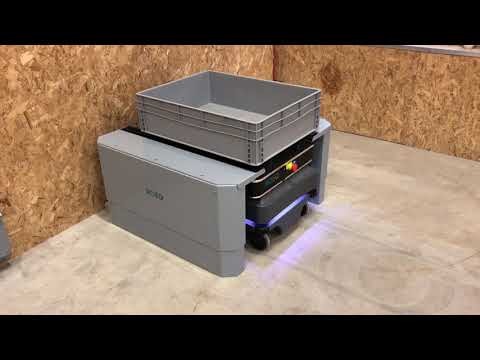 Whether the MiR100™/MiR200™ is assigned with moving pallets around a factory or delivering parcels and boxes internally at a large facility, the ROEQ L150 solves the task. Being able to deliver the payload to the designated docking station, and then leaving it there, creates more flexibility and less waiting time for the MiR100™/MiR200™.